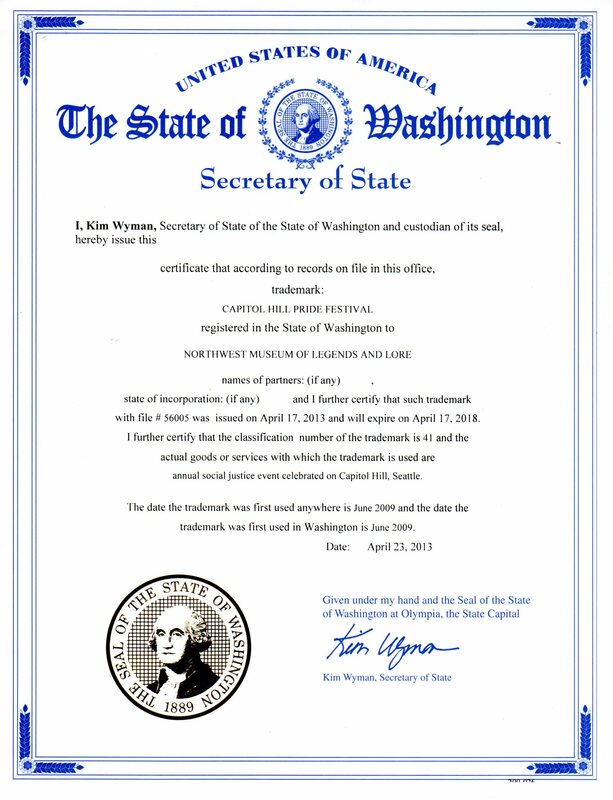 Coming this year - Capitol Hill Pride in Development as its own 501(c)3! The Northwest Museum of Legends and Lore is a 501(c) 3 educational non-profit supporting the humanities and established its first six years on Capitol Hill and is sponsored in part by the Raynier Foundation founded by museum supporter James W. Ray - a Capitol Hill Gay Philanthropist who supported the Humanities and created the Raynier Foundation and namesake of the James W. Ray Orion Center Youth Center for homeless youth. The museum has scheduled events in the Northwest for the past fourteen years hosting many authors and lectures and cultural arts groups including conferences at Seattle Center and most recently the Seattle Faerie Festival. The museum still conducts the Capitol Hill Historical Ghost Tour with an extensive knowlege of the area and history highlighting the famous legends of Capitol Hill such as Bruce Lee, Kurt Cobain, Jimi Henrix, Frances Farmer and historical figures such as Bertha Knight Landes- Seattle's first woman Mayor, Roy Olmstead and many others. Now shifting to online, the museum remains active with the community and the Broadway Business Owners Association (BBOA) and has established the first Pride Asia at Hing Hay park in the International District. Occasionally, the museum can be seen on current Travel Channel shows such as "Mysteries at the Museum" and the Discovery Channel. 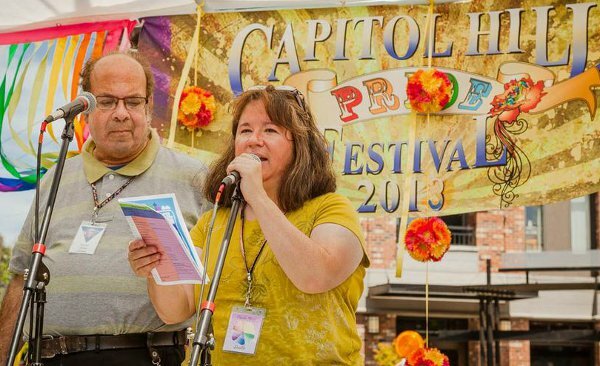 Director Charlette LeFevre as elected Vice-President of the Capitol Hill Community Council in 2008 and Chair of the Arts and Events Committee ran on a platform of establishing LGBT events and organized the first Capitol Hill Pride Festival in 2009 as a two block festival. That year the museum became the fiscal agent and organizers for the festival as the Community Council lacked a business license and even though approved by a community vote opposed the start fearing parking meter fees. Despite obstacles, its first year, the festival drew 5,000 in attendance and in 2010 and 2011 the festival became a five block festival drawing an estimate of 30,000 throughout the day. The event has become the largest single day event for Capitol Hill and Seattle's and the Northwest's largest Pride Street festival. The festival Directors are committed to keeping the festival a grass roots social justice community festival on Capitol Hill as a fiscally responsible agent and stewardship and showcasing new and emerging artists on the festival stages as well as furthering the recognition of the Art of Drag as a cultural art form and expression. The festival is the site of the Rainbow Women's Health Fair in its 15th year and for the first time hosted the Navy. Charlette LeFevre - is current Director of the Northwest Museum of Legend and Lore since 2004. Combining science and events, Charlette shares a social justice interest in her activities and writings. Charlette has a BA in Research and Design from Wright State University. Past positions: 2008 Capitol Hill Community Council VP and currently contributes on social justice for the Seattle PI Capitol Hill Neighborhood Blog under the name Charlette Report. Accomplishments: Saving four large trees on Capitol Hill's Broadway, Receipient of BIA Leadership Award, helping establish the Seattle city ordianance that bans the display of human remains without the deceased's consent. Philip Lipson - Librarian has a Master's degree in Library Science from Wayne State University in Detroit and has had experience in both public and academic libraries. Co-Director of the museum since 2004, Philip Lipson is writing a book on the Air Force's first military plane crash in Kelso and is Booth Director for the Capitol Hill Pride Festival. Philip Lipson has worked for the IRS and has helped organized the budgets for many conferences. In 1980 Philip ran for Sheriff of Wayne County, Michigan, Libertarian Party. Lucky for the library he lost. His slogan was "Behave Yourself", a motto he still lives by today - or so he says. Copyright © 2012-2017 Northwest Museum of Legends and Lore. All rights reserved. Northwest Museum of Legends and Lore within the State of Washington. 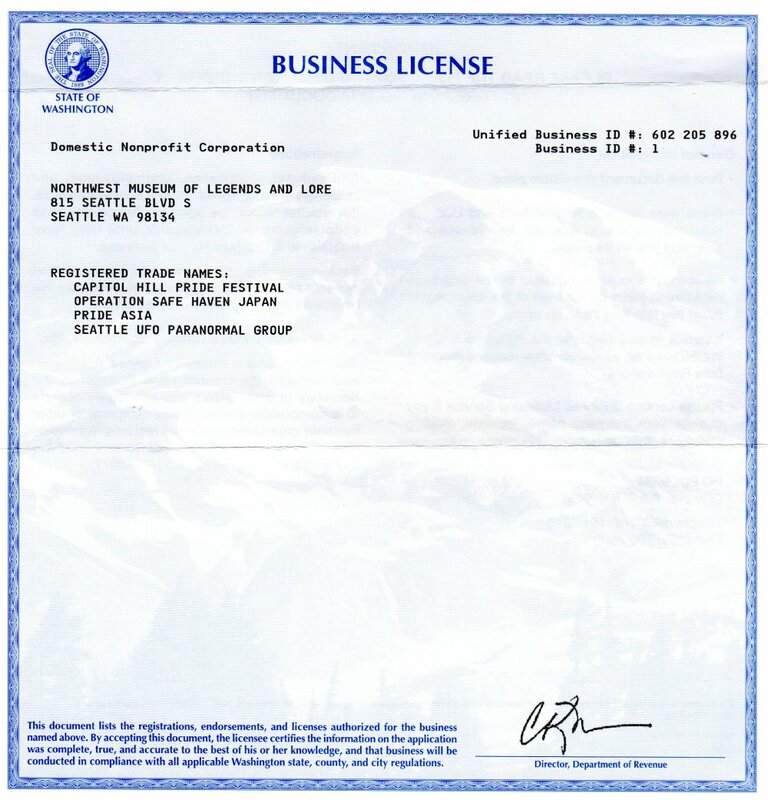 The name "Pride Asia" is a registered trademark and tradename of the Northwest Museum of Legends and Lore within the State of Washington. the Northwest Museum of Legends and Lore.